The TG-5 has the imaging power you need to never miss a shot. Its specialized image sensor and dual quad core TruePic™ VIII Processor minimize noise to produce sharp shots in all lighting conditions, even underwater and in low light. Effortlessly capture fast moving subjects without blur thanks to the bright F2.0 high-speed lens. The TG-5 has mind-blowing speed: shoot continuously up to 20 frames per second in full res RAW. Use Pro Capture Mode to nail perfect shots that require split second timing. It buffers a running series of high-resolution images, then captures a precise moment plus the previous 5 frames with a single button press. Inspirational images from Tough TG-5 users. *Speed Class 10 SD card is recommended for shooting movies. *UHS-I Speed Class 3 SD card must be used for 4K video and high speed movie. The TG-5 is a great camera for its intended purpose. It excels as a family vacation camera for use at the beach, around the pool, and as a camera that you can take anywhere without worry. It is a great snorkeling camera combined with the optional fisheye attachment and you can get surprisingly good portraits with background separation if you use the optional telephoto lens attachment. The camera really shines as a tool to capture macro images of bugs and wildlife; there simply is no other system that provides the macro capability that this camera does especially when combined with the light guide attachment and flash diffuser. Image quality is good in natural light and underwater and the Raw files have decent latitude especially when using the Olympus Image Viewer. The entire system (camera, fisheye and telephoto attachments, flash diffuser, light guide, and extra battery) all fit nicely in the compact dedicated Tough System Bag and are easy to toss into a backpack and take on all your outdoor adventures. In summary, it is a FUN camera to use, it is easy to bring along on all your adventures, and it lives up to its TOUGH name. I highly recommend it. Just Upgraded My TG-4! And went backpacking. And I couldn't be happier. I can use all my TG-4's accessories and I still get great image quality (even with less pixels), but now 4K video and focus peaking! 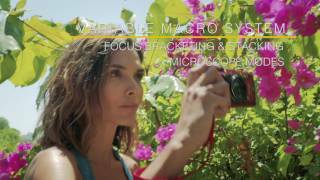 Focus peaking works great with the focus lock and manual focus for capturing great macro shots with an out of focus background. I recently took this camera backpacking, clipped to the outside of my 45 lb pack. I always had the camera handy for spontaneous shots without worrying about damage from the elements or when slinging my pack on and off the ground. A big bang for the buck of Camera! When I first saw this camera online and read the reviews from various people on different website, I knew I have to buy it. I'm glad I did, this camera is so awesome, totally worth the money. I use it for Underwater Macro shots and the quality of the image is already superb, without having to add any macro lens. For anyone who's looking for a great camera for a very reasonable price, this is the one for you. Back in high school I did a lot of photography. In 2018 - my cell phone became my daily driver. But I was doing a lot of hiking and outdoor activities and my phone was dying at the end of the hike. (I was using it for both navigation and picture taking). There is a lot of functionality that my old P&S camera just did not have (that the TG5 has), notably the high burst mode, larger iso range, RAW images. The 'ProCapture' is handy as well (where you fire in burst but images are stored in a buffer until you press the shutter all the way down - so you capture only the action you want) Granted - some of the more high end P&S's in other brands have some of these too - but I don't think they're IP68. The only glaring omission is a shutter priority mode. Not really a big deal shooting landscapes, and a sports scene mode takes care of forcing a fast shutter speed. But if you wanted to do a long exposure, there are some options hidden in the 'scene' mode that you could work with. 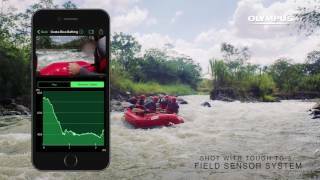 You still get a lot of control with your camera, and with the use cases this camera is aimed for (tough, outdoors) - you probably don't need the shutter mode. GPS acquisition can be slow and uncertain at times. I imagine if I use the logging function while shooting i'd have a better experience in Geo Tagging my pictures. My conjecture is this (logging + Geotags) was the intended purpose. The tracking is handy and fun to look at , but it's only available in the app - Note: I would never use it as a primary navigation device. Use a phone or get a dedicated GPS. The WiFi only connects to the phone app - as far as I can tell I can't connect wirelessly to a PC. I don't really use the app. Seems silly to move the pictures to the phone to then move them to the computer. It was much easier to use a large SD card and plug in the usb to transfer pictures to my computer at the end of the day. Handy to get photos up to your family or friends quickly if you want to share that one photo right now. In short - if you're looking for a P&S camera, have the budget for the TG5, and go outdoors once in a while - I think the TG5 should be where you begin and will probably end your search. I am a little wary as to the UX of the additional lenses, but I intend on trying them out. I hope investing further in the system says a lot about how I'm going to use the TG5 going further. I've had this camera for 3 years now and have put it through it's paces. It's held up beautifully through it all. It's been dropped on rocks, taken in rough ocean waters at the beach, been on countless hikes and white water rafting trips, dragged through muddy, narrow caverns in West Virginia, and it still works perfectly. Screen protector and lens cap is a must if you are a harsh on this thing as I am. I have a few scratches on the screen now, but have thankfully avoided any lens mishaps. Pros: -Tough as advertised and totally water proof for general use (unless you dive deeper than 50ft, in which case, they do make an extra underwater housing for it). -Great color - very true reds (I have had issues with my Cannon and Sony cameras over exposing the reds and I really appreciate how beautiful and true to life the colors in this are) -Lots of features for a little camera -Awesome macro capabilities -Light weight and fits in your pocket -Has several, easy to use attachments (I use the flash defuser for a lot of macro shots and love it) - Love the WiFi feature, easy to use, and I can use the phone's touch screen to select where I want to focus. Cons: - Call me old fashioned, but I like having a view finder for those shots when its so bright out you can hardly see the screen, wish it had one, but I understand it would have been difficult to fit (they packed a lot into this as it is). -No shutter priority (I bought filters for it to do those nice silky waterfall shots and then realized it had no shutter priority, so I couldn't do that very effectively) - Auto-focus is a bit finicky when doing super close up shots (Always wants to focus on the back drop not the thing right in front of it, but this is an issue I have with most of my cameras) Overall this is a fantastic camera for the size and price point. You can use it for just about anything, I would highly recommend it if you do a lot of traveling. It's compact and versatile, and it's wonderful to never have to question if your camera is going to be okay taking it to go do an activity. I always used to be afraid to take my cameras on boats or into wet or potentially hazardous conditions and its just awesome to never have that worry. Great go anywhere camera capable of high quality photos. I have had my Tough TG-5 since August 2017. It literally goes with me almost everywhere Mountain Biking, Mountain Unicycling, Motorcycling, Hiking, to the Beach, Family activities, etc. If you work within its designed limitations you can get amazing photographs. I feel it is at its best shooting wide angle and for Macro Photography. I have shot, and received recognition, for anything from Landscapes to Macros of Arthropods with this camera. The video works well and the slow motion is particularly fun to work with. This little camera is full of wonderfully useful features. Some of the modes and features I use most are Microscope which is 1x- 4x magnification, Super Microscope 2.9x - 44.4x manification, In camera Focus Stacking(for large depth of field macros), Then of course the different scene modes Sunset, Nature, Hand Held Night Shot and Live Composite. This camera has many more features and lots of art filters. I just listed the ones I use most. You can see samples of my photos in the Olympus Tough TG-5 gallery. The one weak point of this camera would be at full zoom. The images are a bit soft. I do not consider that a real fault of the camera. It is more a result of the physical limitations of a small sensor camera working with a completely internally working lens. I also have both the LG-1 and FD-1. I tend to use the FD-1(Ring Flash) most when shooting Macros of Flowers at night and when shooting Arthropods. I also find the FD-1 is great for limiting the power of the flash when using it as a fill flash. The LD-1(LED Ring Light) works well with static objects. The Tough TG-5 is not just a camera it is a well designed part of a well thought out system that works seamlessly together. So far, I am impressed with this little camera. Bought this camera to replace my Ricoh sport camera that died on me while snorkeling in Grand Cayman last year. After much research and interpersonal communication with other photographers, I selected the TG-5 and could not be happier. The picture quality is excellent and the software incredibly advanced; I can get excellent shots even in the auto mode. Love the macro capabilities. Hope that the LCD last longer than the ones in my previous Canon D-10 cameras. 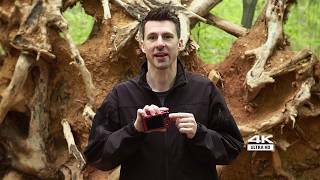 Need help with your Tough TG-5? We’re here to help. Built for adventure with pro features. Start building your TOUGH TG-5 System now. Take your TG-5 further with these exceptional lenses. Add these custom add-ons and adapters to your order and do more with your TOUGH TG-5. *Please note that with your body only purchase, the TOUGH TG-5 comes with a USB cable, hand strap, LI-92B Li-ion battery and F-5AC Li-ion battery charger.